The scope of the farm is staggering. Fifty-six poultry sheds, each covering an area about the size of a football field, are spread across a swath of California’s Central Valley. It is well into the first day of spring. Leaden clouds shroud the brilliance of a half moon, and a recent downpour has abated to sporadic raindrops. While the town sleeps, I follow animal activist Christine Morrissey across a muddy field toward one of the sheds. Even cloaked in darkness, it is clear the chicken ranch has a variety of disquieting industrial features. I can sense the drone of electric power, the mechanized efficiency, the anomalous warmth, and the decay. It’s like a protean, Fritz Lang nightmare brought to you by Farmer John. Christine, director of East Bay Animal Advocates (EBAA), opens the unlocked door of a shed and steps through. I follow, and the overwhelming force of ammonia assaults my eyes, nose, and lungs. This is the odor of decomposing avian feces, and it is poisonous. Blinking hard in the low light, I see them: white “broiler” chickens, 30,000 of themabout what 15 people, on average, would consume in a lifetime. Assuming all the sheds are this crowded, there are nearly 1.7 million chickens on this ranch tonight. The birds are large and surprisingly vocal, squawking and clearing a path for us. Small, dim light bulbs dangle from the ceiling, but I am unable to discern the far end of the building. The air inside is so thick with particulate matter that most of the images I photograph with my digital camera end up obscured by magnified white spotsdust, bacteria, and mold spores that reflect the camera flash like toxic mirrors. Christine notices a chicken lying dead near the corner and crouches to document this bird on film. She takes several pictures of chickens and the shed’s interior and then adroitly places a live bird into her canvas bag. I search for chickens who look sick or injured and immediately spot one who seems to be limping. While other birds move away in mild panic, this one lowers herself onto the feces-covered floor. She protests as I place my hands on either side of her and gently keep her soft but powerful wings from flapping; I cradle her with my right arm and slip her into my bag. “You’re going to be okay now,” I say. Christine has already added a second chicken to her bag, and I notice one pressed against the wall behind a number of other birds. He resists only slightly as I pick him up, and Christine helps me put him into the bag. 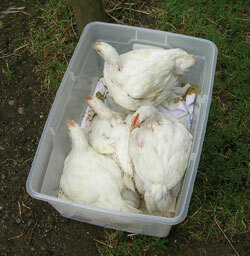 We had hoped to save six or more birds, but they are nearly full-grown, and our bags will only hold two apiece. EBAA has a growing reputation among animal protectionists as one of only a handful of organizations in the U.S. currently engaged in open rescues. This is animal abolition at its most fundamentala group of committed activists saving the lives of unattended and neglected animals who are left sick and dying in factory farms. From its base in Oakland, on the eastern side of San Francisco Bay, EBAA focuses on education, legislation, and rescue work for animals. Christine and her team also use video and still cameras to document the conditions they see, publicizing the images online and sending them to the media. The group goes to great pains to prepare for investigations, while I had only imagined what it might be like. To prime myself, I viewed images of farmed birds, both alive and dead, on www.free-range-turkey.com, one of the sites EBAA maintains. I tried to acclimate my sensitive nature to the sight of animals left to suffer without veterinary care or dead from industrialized abuse. The images on the site are appalling: debeaked chicks, sick and injured birds, and lifeless turkeys discarded in trash bins like so much garbage. Each entered the world looking for his or her mother and was greeted with cruelty. This was my rehearsal, keeping my outrage and grief stitched up. The last thing I wanted was to be too upset to record the events or, worse yet, compromise the rescue. Emotions could come later. While the practice of entering a factory farm or vivisection lab to liberate animals is nothing new, the activists practicing such rescues have traditionally kept their identities hidden. Australian activist Patty Mark was the first to literally put a human face on animal rescues. In the 1980s, her Melbourne-based organization, Animal Liberation Victoria, pioneered the notion that activists do nothing to conceal their identities and even welcome prosecution. Going to courtor to jailhelps focus attention on an issue that agribusiness makes every effort to keep from public view. This philosophy of applying Gandhian tactics to animal welfare was initially met with skepticism when Mark addressed a group of activists in the U.S. six years ago. Mark was a featured speaker at United Poultry Concerns’ Forum on Direct Action, where she showed a powerful video of her team in a highly compassionate and organized rescue of some battery-caged hens. Attendees then saw a video made by a controversial, underground group known for covert rescues and violence. This second group appeared to demonstrate less compassion for the animals they were liberating, and attendees agreed that Mark’s open rescue model of activism was the one that would most resonate with the general public. Activists in other countries, like Austria, Germany, and Sweden, are also heeding the call. Christine is now one of the model’s most active proponents, having rescued 53 animals in just two years. “I’d always had a major regard for animals,” she says, tracing her path to activism. Her first job was at a McDonald’s restaurant at the age of 14. “I tried to go vegetarian then, but it didn’t stick.” Eight months later, while watching HBO one night, Christine happened to see the gruesome 1996 film To Love or Kill: Man Vs. Animal. This award-winning documentary graphically depicts animals around the world being killed in the most horrific ways. “I was completely shocked,” she says. “I didn’t know what to do with myself; I was on the verge of having a breakdown just watching the jarring footage. Two days later, I had my last meat-based meal.” By the time she had enrolled at the University of California, Berkeley, she was a bone fide activist, protesting against vivisection on campus. After graduating with a degree in political science, she volunteered at animal shelters and then, in May 2003, organized a protest against a local circus. The demonstration, well-attended by the media, encouraged her work for animals, and she formed EBAA with five of the other protesters. Going public, of course, increases the activist’s chances of ending up in court, in which case they use what lawyers in the U.S. call the “necessity defense.” This defense argues that conduct that would otherwise constitute an offense is justified if a reasonable person was compelled to engage in the proscribed act. In the case of an open rescue, lawyers could argue that any crime committed (such as trespassing) was justified by the need to prevent a greater evil (animals suffering or dying from neglect). Activists would also use the trial as an opportunity to get videotaped evidence of routine cruelty to animals into the public record. Not surprisingly, however, agribusiness has been reluctant to press charges in these cases, which generate negative publicity and focus unwanted attention on what’s going on behind closed doors. Sarahjane Blum and Ryan Shapiro of GourmetCruelty.com discovered this last year. Both were arrested for their involvement in openly rescuing ducks from Hudson Valley Foie Gras in New York, but charges of felony burglary were eventually dropped. “I think that the resolution of the case demonstrates that Hudson Valley Foie Gras is scared of continued exposure of its routine animal cruelty,” says Blum. The stakes got higher for California activists in January 2004, when the state toughened its farm trespass laws, ostensibly in the name of homeland security. Anti-terrorism has become a major issue in the wake of the September 11th attacks, and it’s also being used as a pretext to target the animal rights movement. Legislators said California’s new law, which increased fines and potential jail time, was to prevent terrorists from attacking food production facilities and introducing a disease, chemical, poison, or other hazardous material into the food supply. The connection between government and agribusiness has only gotten stronger in the last 30 years as the federal government has encouraged the trend toward large-scale corporate farming and animal agriculture has developed into a major economic constituent. The government even grants agribusiness remarkable financial incentives, subsidizing grazing land, for example, which allows ranchers to graze their cattle at one-tenth the market price (costing taxpayers at least $128 million a year), and sanctions the removal and slaughter of other animals, such as wild horses, deemed to be competing with cattle for forage on this land. As the power of agribusiness grows, Congress continues to pass federal programs that benefit factory farms, while state and local statutes, like California’s recent trespass legislation, are enacted to protect factory farms. Christine says the new law is not going to influence EBAA’s efforts to document abuse on factory farms and give aid to animals in need. She has faith in the exigent circumstances under which open rescues are conducted. So far, Christine and her team have yet to be charged with any crimes associated with their work. Activists involved in rescuing animals from industrial production, either openly or covertly, must also cope with the range of emotions this work engenders. They struggle with the anguish, the frustration, and the sheer abhorrence of both the corporate hegemony and the consumer behavior that keeps animals exploited. And then there’s the troubling memory of all the defenseless animals they had to leave behind. Even through a haze of pollutants, the thousands of birds we could not rescue is a clear vision that haunts me. They are all dead now, their blurry portraits on my computer screen reminding me of the misery nine billion chickens endure every year in this country. Still, it’s hard to not be euphoric seeing rescued animals enjoy their first taste of freedom. Only hours after liberating the four chickens, Christine transports our new friends to the haven that will be their home. She reminds me that in addition to being the first day of spring, today is the Great American Meatout. What an auspicious day for new beginnings. Under a cloudy skythe first time they’ve seen such a sightthe chickens huddle together. We bring them indoors temporarily, where they mingle with eight hens rescued the week before from an egg farm. Here they enjoy fresh water and their first low-fat meal. Safe from the toxic fumes, overcrowding, dimly lit sheds, stress, and a grisly death, the rescued chickens have begun new lives free, as never before, to indulge their natural behaviors. Christine refers to these birds as ambassadors of their species, the lucky ones whose remaining lives will represent the billions of others still imprisoned. They still face challenges, though. Their bodies are encrusted with feces, and they have lost many of their feathers. While proper care and a clean environment should take care of these conditions, the worst may be yet to come. Modern farming methods have increased the chicken’s growth to unconscionable levels, resulting in physical abnormalities. In the 1950s, it took 84 days to raise a five-pound chicken. Todaywith agribusiness using selective breeding, special feed, and growth-promoting drugsit takes just 45 days. Thus, most of the chicken’s body grows rapidly, but the skeletal structure lags behind and cannot support the immense weight gain. 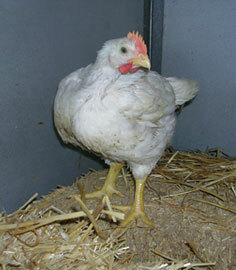 Consequently, most broiler chickens have crippling leg disorders. They also commonly suffer lung problems and congestive heart failure. Sadly, should a chicken happen to live beyond seven weeks (when most are slaughtered), he or she will likely endure chronic health issues. Indeed, three of the birds we rescued exhibit the early stages of bumblefoot, a potentially fatal foot infection caused in part by being overweight. But at least they know what it means to breathe fresh air. To enjoy the company of flock mates and feel the sunshine. To live for themselves and not for their flesh. Others may be joining them soonEast Bay Animal Advocates is already planning its next rescue. Mark Hawthorne is a contributing writer at Satya. For more information on EBAA, go to www.eastbayanimaladvocates.org. For a poignant account of one of these feathered ambassadors in Christine’s own words, visit www.turkeystory.com. To learn more about open rescues, read “Opening Doors and Eyes to Animal Suffering, ” The Abolitionist Interview with Patty Mark at www.openrescue.org/news/20030327.html.